Meet Dylan Jacob, the 24-year-old serial entrepreneur, and inventor. 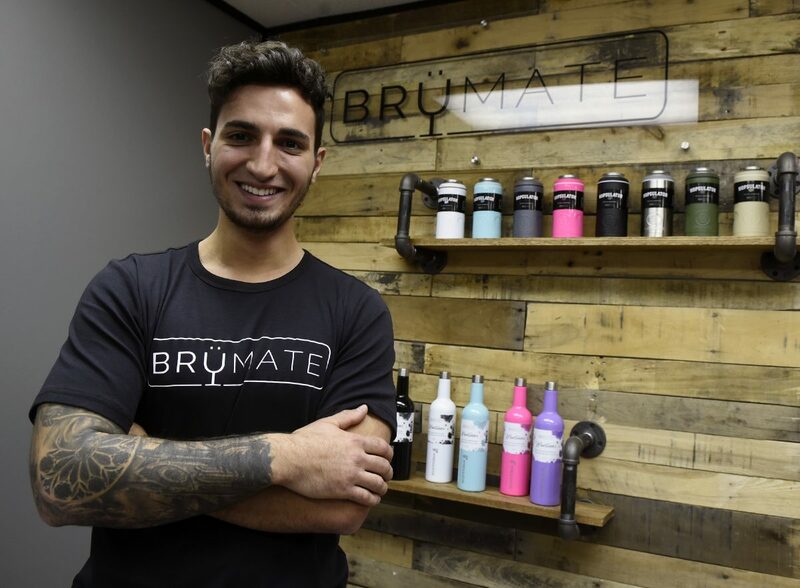 Dylan has founded four companies and is now focused on his fast-growing brand, Brumate. Brumate creates/innovates/ and sells insulated beverage containers for the adult beverage industry. Dylan, an article from Shopify recently came out about how your company, BruMate, is grossing $15M per year. Can you tell us the story of how you founded BruMate? I grew up with a passion for creating value through a variety of side-hustles – from landscaping and flipping cars to phone repair and remodeling houses. BruMate is my 3rd company, 2 of which I have successfully exited. All of my previous businesses have been created from a gap in the market I’ve identified through my own personal experiences. You can sit around all day thinking of the “perfect idea” and it may never come to you but analyzing your day-to-day interactions and thinking of ways to improve them is one of the easiest ways of validating/coming up with a product or service that people truly need. The idea for BruMate stemmed for my love for ice-cold beer. I was sick of walking away for 5 minutes and coming back to a half-drunk, semi-warm beer. I only drink 16oz cans and there weren’t any products on the market that were created for that can size – that sparked the original idea. I knew that if I was having this issue that other people were too so I started having conversations with others who preferred 16oz cans and their feedback further echoed my negative experiences, proving my initial concept for the Hopsulator – the world’s first 3-in-1 insulated can cooler for 16oz / 12oz beverages. I wanted to start a movement that I knew everybody could get behind and set out on a mission to put an end to half-drank beers, warm wine, and wasted spirits. My mission with BruMate is to reshape the way people drink and create the perfect drinking experience for our customers. Walk us step-by-step through the process that you had to go through to get from the early stages to where you are today. After validating the idea for the Hopsulator with our target market I set out to create our first MVP (minimum viable product). I had the vision for what I wanted the final product to be but knew I didn’t have the money or validation yet to make the jump and spend the money necessary to bring it to life. Instead, I flew to China and met with a few manufacturers that created similar products for other companies (coffee mugs, water bottles, etc), picked the most fitting of the 3, and then began working with their in-house engineers to create the cheapest version of the Hopsulator possible. Before pulling the trigger I went to a Sun King, a local brewery in Indianapolis that specialized in 16oz cans at the time and met with the founders to show them my concept and get their feedback. After a brief meeting, they were all on-board and committed to launching them whenever our first order came in. After they committed I went ahead and began the molding process, placed an order for a few thousand dollars in product, and launched them in their stores to gather customer feedback and use that to reshape the final product. The new mold ended up costing A LOT and I knew it was going to take 5-6 months minimum to get the final product in hand (it ended up taking 10 months) so I began working on other products that fit within the adult beverage category that I knew people needed a solution for. Our next product was the Winesulator, the world’s first insulated wine canteen designed to keep a full bottle of wine at its ideal temperature for over 24 hours without any ice needed. In order to gauge interest, I launched some generic Facebook ads for a 3D render of the Winesulator to gauge interest. I touted it as the perfect Christmas gift, redirected customers to a landing page to capture their email, and had gathered over 7000 emails before we pulled the trigger for production. After we began production I launched pre-orders on Black Friday 2016 for our incoming shipment generating around $250,000 in revenue and narrowly missed our shipping deadline for Christmas. We had around 6000 orders that had to be fulfilled. Our inventory arrived on December 9th, a week late, and we only had a few days to get everything shipped out in order to make sure everything arrived with plenty of time to spare for Christmas gifting. We completely sold out of our first batch of inventory in 2 weeks. In order to sustain growth and retain ownership of my company, I spent the next year doing pre-orders, selling my house, maxing out credit cards, and doing everything in my power to order as much inventory as possible to stay in stock but it was never enough. Year over year we have seen over 1000% growth (10,000% since our launch less than 2 years ago) and continue to grow exponentially month over month. In February 2017 I launched our 8oz insulated stainless-steel wine glass and in May 2017 I relaunched the final version of the Hopsulator TRiO. In July 2017 I discontinued the 8oz wine glass after a few competitors had copied the idea. I relaunched it in September as our UNCORK’D XL series which is now the largest insulated wine glass in the world, fitting over ½ a bottle of wine. Since then it has been all about listening to our customers and releasing products at their request / making necessary changes to our product lines based on customer feedback. Customers are the driving force behind every company and I do everything in my power to make sure I am giving them exactly what they want, sometimes before they even know they want it just based off of things I have heard echoed within our focus groups/customer groups. I don’t think I really ever “decided” to become an entrepreneur. It was an evolving process that stemmed from me jumping from hustle to hustle and ultimately shaping my mindset into what it is today. At this point, it is a lifestyle more than it is a career. Tell us about the challenges you’ve had and walk us through the process of what steps you’ve taken to move forward. One of the biggest challenges I have faced and continue to face is keeping up with our fast-paced growth without taking on any outside funding. I have had to get really crafty with pre-orders, lines of credit, credit cards, inventory financing, and other methods of funding to help sustain us while maintaining ownership of the company. The second challenge that I have had is learning to pivot, FAST. I have had to train myself to be self-aware / look for negative trends or issues with our products so I can take care of them in their early stages before they manifest into something more serious. This is a skill that has taken a while to master but at this point, I am a huge believer that the ability to pivot and move direction as needed to prevent stagnation or epic failure is imperative to any companies success. Why do you think Brumate has been so successful? BruMate has been successful because I focused on one specific niche and set out to be the absolute best within that space. We make awesome, super unique products. I listen to our customers and provide them with things they actually need so, making a sale isn’t hard. Every single one of our products solves a real problem. I am constantly listening, innovating, and improving. By the time someone knocks off our products we have already launched a new version so that one is outdated, it makes it impossible to keep up and has allowed us to crush our competition. What do the next 5 years look like for you? My immediate plans are to focus on scaling BruMate into a 9-figure company. My future plans are to start an accelerator program for e-commerce brands to help other people with a unique vision scale their existing companies into digital giants. What is the best advice you have for people wanting to start a business? A lot of people are really scared to talk to other people about their ideas in fear that someone else will steal their concept and run with it. But, I am a believer that before setting out to create any product or service you should be out there talking to your ideal customer base to help shape and transform your concept into a viable product that the general population will get behind. While your overall problem may be a common one, everybody’s interpretation and experience are different so certain features or applications that may be relevant to your experience may not match everybody else’s. A lot of people run with their initial concept without actually talking to anybody about it because it is their baby and naturally people don’t like being told they are wrong. I encourage people to go out and talk to 5-10 potential customers, take their feedback, and use that to help shape the initial MVP (minimum viable product). Everybody wants their initial launch to be perfect but that isn’t feasible. If you look at any successful company in the market and then look back at where they started you will see a drastic shift in focus/strategy. Change happens over time, just get out there and get started. Jeremy Miller is a young nationally known entrepreneur and marketer. Jeremy started inventing things at the age of 7. By 16 he had already created his first company. Fortunately, as he explains, his first company failed at a loss of $8k. By the age of 18 he turned around and built a successful advertising agency called Inspired Blue Media with national clients and national press recongition. Now, Jeremy is the Director of Marketing at the fast-growing technology company, SnapShyft. Jeremy Miller was the 2018 Nominee for Tech Points Rising Star Mira award for “Best in Technology in Indiana”. Jeremy has been featured or mentioned in 50+ publications and websites including Forbes, The Next Web, Inc. Magazine, Channel 13 News WTHR, The Huffington Post, BuzzFeed, The Daily Beast, Influencive, Mashable, Future Sharks, Success Magazine and many more. Jeremy’s Forbes Feature was the #1 trending article on LinkedIn in December of 2017 and ranked #1 on Google for “Forbes Entrepreneur” with 17M search results also in December of 2017. Jeremy was ranked in the top 25 influencers to teach about social media in 2017.